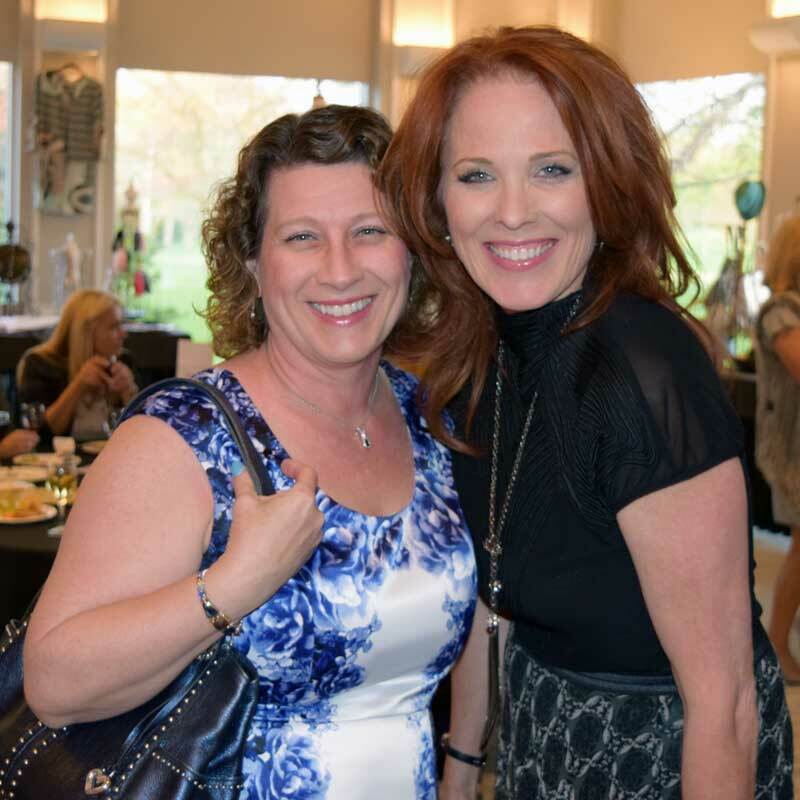 Sharing a light-hearted moment with emcee Bonnie Conte (right) of Avalon Salon in Deerpark, at the May 5th Long Grove Mother’s Day Fashion Show at the Grove Country Club. I could be wrong, but I’m guessing that male politicians don’t get asked to model in many fashion shows. If they do, I’m pretty sure it does not involve wearing a dress, high heels, and lots of accessories (let’s not even mention the indignity of spanx!) Last month I was asked to help support a local not-for-profit group by modeling in their “Breakfast at Tiffany’s” fashion show fundraiser. The Caring Women’s Connection helps a number of organizations and programs in Lake County serving women and children such as: A Safe Place, Lake County Haven, Mount Saint Joseph, Stuben House, and scholarships for deserving high school seniors. I was happy to assist in raising funds for these worthy causes…but modeling? Did they know that my last experience walking the runway was circa 1975, wearing my hand-crafted, (blue-ribbon winning!) 4-H sewing project at the McLean County Fair? These days I’m more accustomed to making speeches or running public meetings, but anything for a good cause, right? The day was actually a lot of fun and I got the chance to make connections with some fantastic women. The dress that I showcased came from Fashion In Motion, which is a pink mobile truck featuring beautiful clothes and accessories for sale instead of tempting food items. For more information on the work of this dynamic and caring group of ladies visit their website at CaringWomensConnection.com. Backstage with fellow models Cris Grooms (center) and Rita Foley (right) at the “Breakfast at Tiffany’s” Fashion Show sponsored by the Caring Women’s Connection. Another local fashion show was held last week in Long Grove and this time my support came by way of raffle tickets purchased, boutique shopping, and cheering on the efforts of our hometown merchants. Over 150 fashionable ladies gathered to see the newest looks of the season just in time for Mother’s Day, courtesy of Long Grove boutiques Olivia’s and Bella Donna. It was a delightful evening of shopping and conversation with friends and neighbors, with the raffle proceeds going towards the fight against breast cancer. Here’s to high style, philanthropy, and lots of lovely ladies! 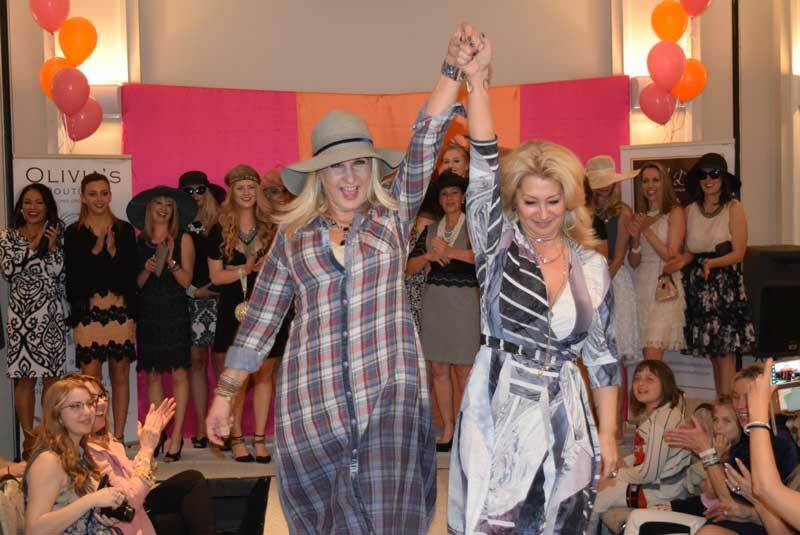 Boutique owners (L to R) Mira Pinscher of Bella Donna and Lynne Jankovec of Olivia’s walk the runway to celebrate the conclusion of another successful fashion show.